Chair pose, or utkatasana, is a powerful standing yoga asana that requires balance, stability and strength. The arms extend upward alongside the ears, while the knees bend as if sitting on a chair. 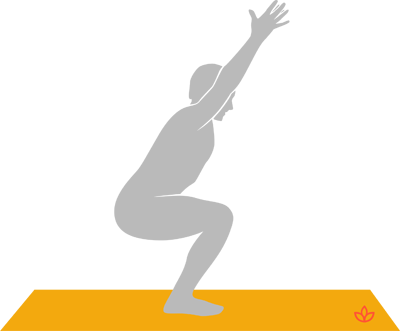 Begin in mountain pose, with your big toes touching. Inhale, bend your knees slightly and raise your arms above your head. Draw your shoulder blades down and your navel in (do not collapse into the lower back). Lift your chest, lifting through your heart. Breathe as you hold the pose.